THIS IS IT! Talk about great models . . . entirely "scratch" built, it is one of those models that shows a great deal of skill and commitment. Lift off the cabin housing and you will find a steam engine and two separate 9V batteries that power the two separate lighting systems. The deck fittings are all there, just like on a real vessel . . . anchor, windlass and even a spotlight that turns. It even has a homemade smoke generator for the funnel! The vessel is in 2nd paint. 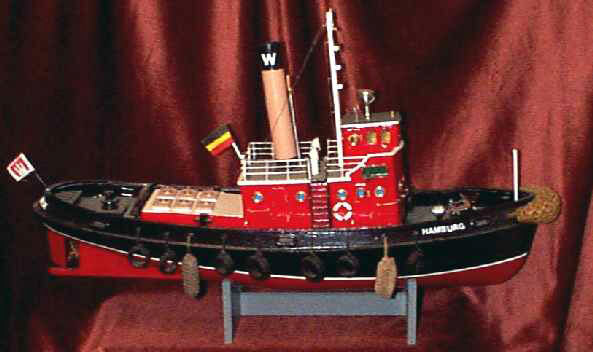 One has to believe, that as well detailed and operational as the model is, that the builder, at one time was part of the "crew". My guess would be the Captain. Length of the vessel is 25" from stem to stern and the condition is excellent.